by Divine, Robert A.; Breen, T. H.; Williams, R. Hal; Gross, Ariela J.; Brands, H. W.
Focuses students on the story of American history. 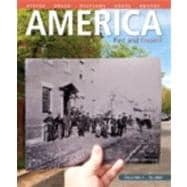 America : Past and Presentintegrates the social and political dimensions of American history into one chronological narrative, providing students with a full picture of the scope and complexity of the American past. Written by award-winning historians, it tells the story of all Americanselite and ordinary, women and men, rich and poor, white majority and minorities. MyHistoryLab icons are paired with images in the text for more thorough integration between the book and online resources. A better teaching and learning experience This program will provide a better teaching and learning experiencefor you and your students. Here's how: Personalize Learning -The new MyHistoryLab delivers proven results in helping students succeed, provides engaging experiences that personalize learning, and comes from a trusted partner with educational expertise and a deep commitment to helping students and instructors achieve their goals. Improve Critical Thinking -Learning Objective Questions at the beginning of each chapter and review features ending each chapter help students understand the material. Engage Students- Feature Essays and "Law and Society" essays delve further into high-interest topics and help students understand the themes. These features are found in each chapter of the text and in MyHistoryLab. Support Instructors- MyHistoryLab, Instructor's eText, MyHistoryLab Instructor's Guide, Class Preparation Tool, Instructor's Manual, MyTest, and PowerPoints are available. For the volume one books a la carte edition of this text, search ISBN-10: 0205910084 Note:MyHistoryLab does not come automatically packaged with this text. To purchase MyHistoryLab, please visit:www.myhistorylab.com. Robert A. Divine, George W. Littlefield Professor Emeritus in American History at the University of Texas at Austin, received his Ph.D. from Yale University in 1954. A specialist in American diplomatic history, he taught from 1954 to 1996 at the University of Texas, where he was honored by both the student association and the graduate school for teaching excellence. His extensive published work includes The Illusion of Neutrality (1962); Second Chance: The Triumph of Internationalism in America During World War II (1967); and Blowing on the Wind (1978). His most recent work is Perpetual War for Perpetual Peace (2000), a comparative analysis of twentieth-century American wars. He is also the author of Eisenhower and the Cold War (1981) and editor of three volumes of essays on the presidency of Lyndon Johnson. His book, The Sputnik Challenge (1993), won the Eugene E. Emme Astronautical Literature Award for 1993. He has been a fellow at the Center for Advanced Study in the Behavioral Sciences and has given the Albert Shaw Lectures in Diplomatic History at Johns Hopkins University. T. H. Breen, William Smith Mason Professor of American History at North­ western Uni­ versity, received his Ph.D. from Yale University in 1968. He has taught at Northwestern since 1970. Breen’s major books include The Character of the Good Ruler: A Study of Puritan Political Ideas in New England (1974); Puritans and Adventurers: Change and Persistence in Early America (1980); Tobacco Culture: The Mentality of the Great Tidewater Planters on the Eve of Revolution (1985); and, with Stephen Innes of the University of Virginia, “Myne Owne Ground”: Race and Freedom on Virginia’s Eastern Shore (1980). His Imagining the Past (1989) won the 1990 Historic Preservation Book Award. His most recent book is Marketplace of Revolution: How Consumer Politics Shaped American Independence (2004). In addition to receiving several awards for outstanding teaching at Northwestern, Breen has been the recipient of research grants from the American Council of Learned Societies, the Guggenheim Foundation, the Institute for Advanced Study (Princeton), the National Humanities Center, and the Huntington Library. He has served as the Fowler Hamilton Fellow at Christ Church, Oxford University (1987–1988), the Pitt Professor of American History and Institutions, Cambridge University (1990–1991), the Harmsworth Professor of American History at Oxford University (2000–2001), and was a recipient of the Humboldt Prize (Germany). He is currently completing a book tentatively entitled America’s Insurgency: The People’s Revolution, 1774–1776. R. Hal Williams is professor of history at Southern Methodist University. He received his A.B. from Prince­ ton Uni­ versity in 1963 and his Ph.D. from Yale Uni­ versity in 1968. His books include The Democratic Party and California Politics, 1880–1896 (1973); Years of Decision: American Politics in the 1890s (1978); and The Manhattan Project: A Documentary Introduction to the Atomic Age (1990). A specialist in American political history, he taught at Yale University from 1968 to 1975 and came to SMU in 1975 as chair of the Department of History. From 1980 to 1988, he served as dean of Dedman College, the school of humanities and sciences, at SMU, where he is currently dean of Research and Graduate Studies. In 1980, he was a visiting professor at University College, Oxford University. Williams has received grants from the American Philosophical Society and the National Endowment for the Humanities, and he has served on the Texas Committee for the Humanities. He is currently working on a study of the presidential election of 1896 and a biography of James G. Blaine, the late-nineteenth-century speaker of the House, secretary of state, and Republican presidential candidate. Ariela J. Gross is Professor of Law and History at the University of Southern Cali­ fornia. She received her B.A. from Harvard University, her J.D. from Stanford Law School, and her Ph.D. from Stanford University. She is the author of Double Character: Slavery and Mastery in the Antebellum Southern Courtroom (2000) and ­ numerous law review articles and book chapters, including “‘Caucasian Cloak’: Mexican Americans and the Politics of Whiteness in the Twentieth-Century Southwest” in the Georgetown Law Journal (2006). Her current work in progress, What Blood Won’t Tell: Racial Identity on Trial in America, to be published by Farrar, Straus & Giroux, is supported by fellowships from the Guggenheim Foundation, the National Endowment for the Humanities, and the American Council for Learned Societies. Henry William Brands was born in Oregon, went to college in California, sold cutlery across the American West, and earned graduate degrees in mathematics and history in Oregon and Texas. He taught at Vanderbilt University and Texas A&M University before joining the faculty at the University of Texas at Austin, where he is the Dickson Allen Anderson Centennial Professor of History. He writes on American history and politics, with books including Traitor to His Class, Andrew Jackson, The Age of Gold, The First American, and TR. Several of his books have been bestsellers; two, Traitor to His Class and The First American, were finalists for the Pulitzer Prize. He lectures frequently on historical and current events, and can be seen and heard on national and international television and radio programs. His writings have been translated into Spanish, French, German, Russian, Chinese, Japanese, Korean, and Ukrainian.